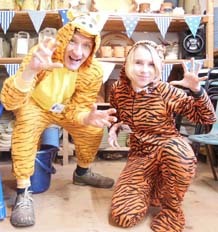 The Tiger who came to tea…at the Pottery! Lottie and myself had great fun over 1/2 term (seems like an age ago now! 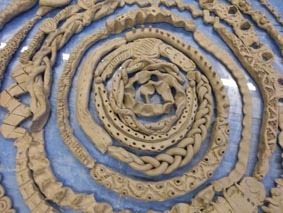 )working with x4 Birmingham Children’s Centres exploring language and learning via the medium of clay. The children’s book ‘The Tiger Who Came To Tea’ by Judith Kerr provided the inspiration and families got hands-on with clay in the Centres and here at the Pottery. Later in the year, participating families will get to see an international theatre performance of the book at Birmingham Town Hall. http://eastnorpottery.co.uk/wp-content/uploads/2019/03/eastnor_pottery_header_2019-3.png 0 0 admin http://eastnorpottery.co.uk/wp-content/uploads/2019/03/eastnor_pottery_header_2019-3.png admin2014-11-23 11:08:052014-11-23 11:08:05The Tiger who came to tea...at the Pottery! For the past 10 years or so I ‘ve been working regularly with the wonderful staff and visitors at St Thomas Children’s Centre in Birmingham. 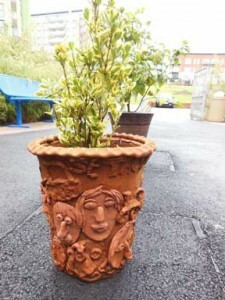 The Centre boasts quite a collection of pots and ceramic curios made with participants of all ages and abilities and whilst I was there a few weeks ago, I took the opportunity to photograph a few of them in situ. Earlier in the year I spent seven wonderful days working with different groups at the creative St Thomas Children’s Centre in Birmingham. 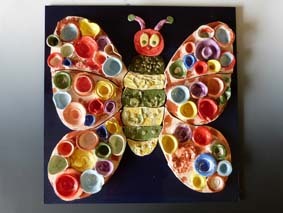 We made a whole variety of ceramic panels and free standing sculpture based upon the excellent children’s book ‘The very hungry caterpillar’. As well as producing some stunning, ceramic artwork, the participants developed their mark making, literacy and communication skills whilst having a creative and fun time. The finished items are on our facebook page for all to admire. I’ve been working with the fabulous St Thomas Children’s Centrethis week and last producing clay work based upon Eric Carle’s classic children’s book The Very Hungry Caterpillar. I’m working with participant groups right across the Centre exploring literacy, conversation, mark making and the creative benefits of working with clay. New parents and their very young children (some as young as 4 months) have been sampling the delights of the potter’s wheel and making foot prints into leaf tiles. Families attending the centre’s popular ‘stay & play’ sessions have been producing modelled fruit and food stuff, riddled with holes made by the devouring insect. I’ve also been working with the St Thomas’s Nursery to build a beautiful, multi-coloured tile panel. As soon as the gems emerge from the kiln I’ll pop some photos up on the website. Spent a stimulating and inspiring day at the City of Birmingham Symphony Orchestra last Friday. This was the third and final in a short series of reflective workshop days set up in partnership with St Thomas Children’s Centre and supported by Bright Space. It was attended by early years artists, educators and arts organisations who are passionate about creative learning for 0-6 years olds and their families. I was fortunate enough to present on aspects of my practice as well as facilitating a practical clay session in the afternoon. 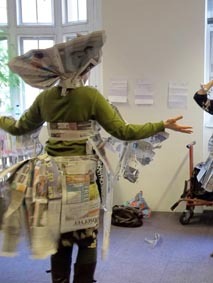 In the morning, Pete Wynne-Wilson and Peppy Hills, both experienced creative practitioners, led a vibrant and inspiring discussion/presentation on best practice in early years, which somehow resulted in delegates dressing up in clothes made from newspaper!